Are you concerned about the pipes in your home? Is it time to re-pipe your Lake Waukomis plumbing? The task of finding a trustworthy plumber to remove old, potentially leaking pipes and install new pipes can be daunting. 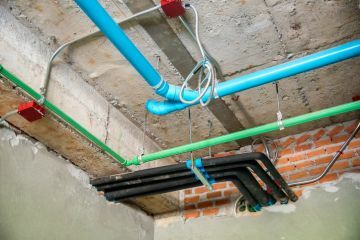 When working with pipes and plumbing, make sure you call a licensed plumber who is fully insured and specializes in re-piping Lake Waukomis homes, to ensure that local building codes will be followed and the job will be done properly and completely the first time. For peace of mind, call the piping professionals at Kevin Ginnings Plumbing Service Inc.. Our plumbers have been installing and replacing pipes in Lake Waukomis, Missouri for more than 34 years, and we'd love to help. Call (816) 832-4322 for a no-obligation written quote to replace some or all of your pipes. If you have experienced any of these issues, it's just about time to re-pipe all or just some concerning portions of your home's plumbing. Kevin Ginnings Plumbing Service Inc. can conduct a complete analysis of your plumbing and help you determine which pipes need more urgent replacement and which can wait, giving you control over your budget. Providing pipe installation in Lake Waukomis and pipe replacement services to local homes and businesses for more than 34 years, Kevin Ginnings Plumbing Service Inc. has built a solid foundation as a straight-shooting plumber who works to provide comprehensive re-piping services in Lake Waukomis at fair prices. Older homes, with older pipes, have pipes that will eventually fail. That's a given. Whether you want to re-pipe your entire home at once and get it over with, or prefer to focus on the problem areas first and replace the rest as your budget allows, we're happy to work with you. Just call (816) 832-4322 to discuss your piping needs. Do It Yourself Re-piping in Lake Waukomis? Aside from the fact that dealing with old pipes is slimy, messy work, there is also the danger that pipes can be broken or improperly sealed when being replaced. The potential for a water damage emergency in your home is probably not worth the risk, to save some money. If you need to replace your plumbing in Lake Waukomis, give the plumbing experts at Kevin Ginnings Plumbing Service Inc. a call for quick service at affordable rates. We'll take the job (and the worries) off your plate.